← Use Your Grey Matter: Was Shakespeare a Feminist? Face Value: Eh. I’m pretty indifferent to this cover. It doesn’t set off any of my usual triggers – it has an illustrated image of the MC, instead of a photograph, you can see the face, it looks appropriately Steampunk-y and appropriate to the book. But it doesn’t grab me and demand my readership either. If I hadn’t read great reviews ahead of time I don’t know if I would have noticed this book on the shelf. Does it Break the Slate? Inarguably, yes. Violet is one of those characters who so obviously fits the mold of a Slatebreaker (brilliant scientist who must disguise herself as a boy to study because her society doesn’t respect her genius as a woman) that the only concerns would be Extraordinary Girl Syndrome (where we have one standout female character surrounded by only interesting men and frivolous “other” girls) or that no attention is paid to developing her character as interesting and multifaceted beyond the initial concept of her character. Luckily, neither of these potential problems is an issue in the slightest. Violet is a fascinating character, with many levels and a great character arc, and she is surrounded by many interesting, smart, Slatebreaking characters of both genders. Who would we give it to? It’s a Steampunk retelling of both Twelfth Night and The Importance of Being Earnest set at a Victorian boarding school. So it kind of has a lot of appeal. I’d quickly hand it over to Shakespeare fans, Oscar Wilde fans, Steampunk fans and feminists. No one who comes to this story from any of these starting points is going to be disappointed in the way Rosen delivers. Review: The one sentence plot summary for All Men of Genius was enough for me in and of itself. When I started this book, I figured I’d enjoy it enough based solely on my love of the plays, the genre and the inherently feminist elements, regardless of the quality of the writing. BUT THEN I READ IT! And it turns out, the quality of the writing was incredibly strong. And the characters are fabulous. And the cleverness of the adaptation, and the ability to create a story that is at once original and familiar is utterly brilliant. 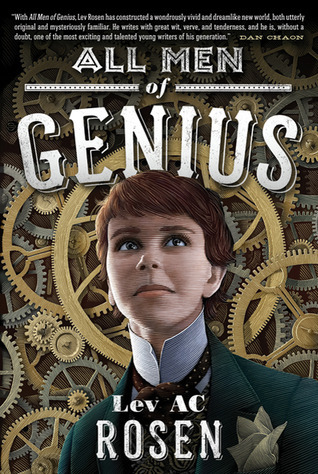 In All Men of Genius, the basic set up is: we’re in a Steampunk infused Victorian England (and can I just say, I really appreciated the real emphasis on the science-y, mechanical side of Steampunk, and not just tacking some clockwork and gears onto everything? but I digress…). So there are lots of fascinating, progressive things in this version of England, but unfortunately, the patriarchy is as firmly established as ever. So even though Violet is about as brilliant as they come, she doesn’t have access to a formal scientific education. So she concocts a plan in which she will pretend to be Ashton, her dandy twin brother, gain admittance to Illyria College, live and work there for a year, at which point she will reveal her gender, proving a point once and for all about women’s scientific capabilities. Violet is a traditionally Slatebreaking character – smart and capable, and explicitly feminist. Her mission at Illyria is partially selfish – she wants to study with the best – but partially noble. Her long term goal is to create larger opportunities for women in the sciences, and many of her inventions are practical in nature, meant to make the lives of women easier. I love that she never questions her intelligence, that she’s impetuous and stubborn, and that she’s a hard worker. Her character alone would have made the book worth it for me. And yet, there’s so much more! It would have been incredibly easy to make Violet the only interesting female character in this world. After all, she’s disguised herself as a boy to gain entrance into an all-male world. But not only are there many fascinating female characters, every character we meet is given a multifaceted treatment. Cecily, the embodiment of both her namesake in Earnest and Olivia from Twelfth Night is far from the delicate flower her source material suggests. Yes, she’s traditionally feminine and a romantic at heart. But this young woman is also a scientist in her own right, who is more than capable of rejecting the unwanted attentions of the Illyria boys who fawn over her. The reason she falls for Violet-as-Ashton is not simply for comic effect, but quite logically, because he is the first of the young men to really treat her as a human being, instead of a prize to be won. The character of Miriam (Twelfth Night’s Maria) is equally fascinating, a Jewish widow who has finally found her own kind of freedom. Even the characters one expects to be raw stereotype, like the stern housekeeper Mrs. Wilks or the bawdy actress Fiona turn out to demonstrate considerable depth. On that same note, gender identity is given real weight throughout this book. Knowing that the story is an adaptation of perhaps the most famous story about gender switching in history, I wouldn’t have been surprised if Violet’s disguise as a man was treated primarily as a plot device, a convention to serve the adaptation and a source for humorous encounters. But the politics of gender are sincerely explored through Violet’s experiment. She thinks it will be easy, at first, her frustration with the social limitations placed upon her gender making her feel certain that life is easier as a boy. But letting go of your identity isn’t as easy as all that – Violet is not trans, she’s using the disguise as a means to an end. And while she embraces her choice, she still struggles with it, especially as she starts to recognize some of the things that aren’t available to her in her masculine identity. There are also frank (well, for Victorian London anyway) discussions of sexuality, both gay and straight, and some steampunk vibrators. Fantastic. Adapting not one, but two iconic plays, while still crafting an original story and managing to balance clever inside references with coherent storytelling is no easy task, but Rosen makes it seem easy. Like anyone else who got their bachelors in Theatre or English (and mine is both), I am pretty damn familiar with both Shakespeare and Oscar Wilde, and Twelfth Night and The Importance of Being Earnest are among my favorites by both playwrights. And as a lit nerd, I was overjoyed by the detail and precision Rosen brings to his adaptation. The garden scene between Cecily and Gwendolyn is one of my favorites in any play, anywhere, for its laugh out loud hilarity, and the recreation of it in this book is stellar, and just as funny as the first one. Violet’s invention that gains her admittance into Illyria in the first place is a perambulator that transforms into a handbag. And it’s more than simply cleverness. Both plays are, at their heart, about mistaken identity. And this retelling crafts a new story, one about disguised identities that become interwoven with true identities, paying homage to both source texts while creating a wholly original and worthwhile read. This entry was posted in Reviews, Theme Week, Young Adult and tagged Boarding School, Gender, Historical Fiction, Identity, Science, Sexuality, Shakespeare, Steampunk, The Importance of Being Earnest, Theatre, Twelfth Night, Young Adult. Bookmark the permalink.